4. All students at Gregory the Great Academy study Latin. What advantages do they gain from being steeped in the language not just of the Church, but of Western Civilization? At Gregory the Great Academy, we seek to teach Latin not simply as a language to be learned, but a language in which to imitate great and holy men, and a language in which to pray with the whole Church. Things can be considered “good” from three points of view: the useful, the moral, and the pleasant. In all three ways, the study of Latin can be considered “good.” Considering usefulness, Latin is directly or indirectly responsible for more than half of English words, and so the study of Latin increases vocabulary, bolsters SAT and ACT scores, and prepares for careers in the sciences, law, and medicine. Moreover, the process of learning any new language often improves students' abilities in non-linguistic areas such as mathematics, and the special precision of Latin syntax is particularly useful to precise and clear thinking. These mental habits gained from the study of Latin lead into consideration of its “moral good.” Studiousness and precision, besides being words derived from the Latin language, are also virtues. Moreover, the literature of the Latin language offers the student access to a treasure trove of the higher virtues of faith, hope, and love. The song of the Knights Templars walking towards probable death, “Crucem Sanctam,” expresses their belief in Christ's victory over death and their hope of sharing in that victory. Thomas Aquinas's beautiful “Tantum Ergo Sacramentum” and Bernard of Clairvaux's “Jesu Dulcis Memoria” move the heart toward love of God. These hymns bring us to the consideration of Latin as a pleasing language, both in the sense of being pleasing to the ears and the mind and as a language that aids us in experiencing the ultimate pleasure of communion with God. The historical development of the Roman liturgy illustrates both: what a feast for the senses a High Mass is, how each note of Gregorian chant accords with the language and the sentiment expressed by the language, and how all of these are centered on the real representation of the holiest moment in history! Moving on from the liturgy, we find Latin remaining the universal language of the universal Church when its head speaks in encyclicals and pastoral exhortations. The mystery of God's Providence in His Son taking on the same flesh as sinful men is recapitulated in the mystery of placing His vicar in a particular location, and in the mystery of clothing this vicar's voice in the flesh of Latin. 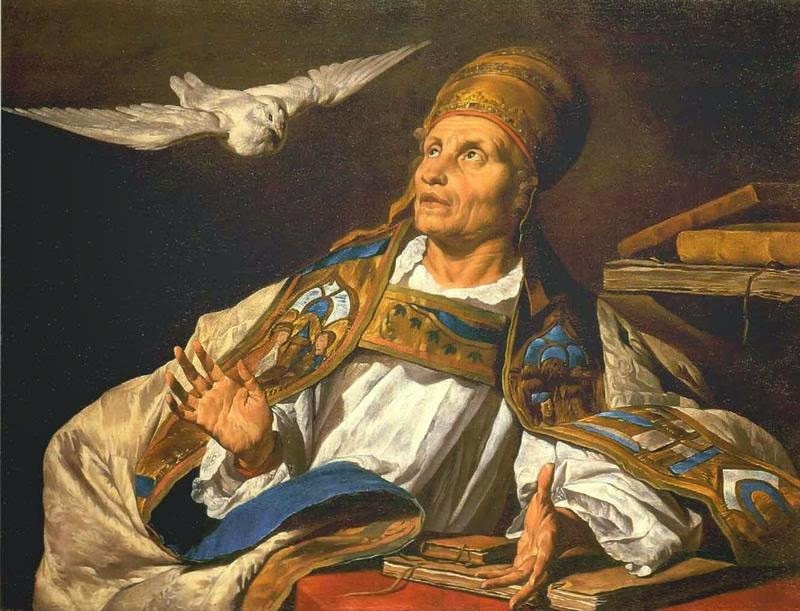 Rooted not only in the universal Church but also in the Western tradition, Gregory the Great Academy seeks to flesh-out Latin. What does this look like? Instead of making the language mere grammar practice, we have our students memorize prayers and songs in Latin. In addition to vocabulary tests, we encourage our students to speak simple phrases and ask basic questions Latinly. As opposed to simply decoding texts by Latin authors, we encourage them to read the Latin directly for comprehension. As much as possible, Latin is not separated from the study of other subjects such as religion and history, but is joined to them, as students read the Latin Vulgate and read selections from the works of St. Augustine. And finally, Latin is present not as a class to be academically conquered, but as a mode of spiritual life. Outside the Mass, the best example is our praying of Compline, joining in the very same prayers prayed in the same language that millions of Christians through centuries have prayed. In this way Latin becomes an entryway to both the democracy of the dead and the kingdom of heaven. 5. If there was time to tell people about just one thing that makes Gregory the Great Academy so special, what would it be? The vision that informs the school has often been called “poetic education,” but it can be given other names as well, for example, “education according to the Muses.” The first thing to note about this kind of education is that it is an approach to the Liberal Arts. What is essential to education in the Liberal Arts (grammar, logic, rhetoric, arithmetic, geometry, astronomy, and music) is that it aims to produce a free man (The Latin artes liberales means arts befitting a free man.) In this context, the “freedom” being sought after is a freedom from the constraints of worldly ends, or, stated positively, a freedom to pursue man's ultimate end or goal which is eternal beatitude. Poetic education differs from other kinds of Liberal Arts education in a number of ways, but I want to focus on three that interpenetrate and reinforce each other: First, it gives precedence to synthesis over analysis, in other words, it values the whole over the part. This may seem like common sense, but in fact most schools, at least implicitly, value the part over the whole. They do this by emphasizing the acquisition of analytical skills that allow their possessors to break down wholes into comprehensible parts. The unspoken premise is that truth is to be found in the part, or, more fundamentally still, that matter is higher than form or that form does not even exits. A second way that poetic education differs from the usual Liberal Arts curriculum is in the precedence it gives to experience over what might be called “remoteness.” This remoteness takes any number of forms, but three examples are textbooks, scientific experiments, and the increasing use of communications technology in the classroom. Textbooks are an attempt to present complex, wide-ranging, and difficult subjects in an attractive and easily accessible form. The problem with this is that it short circuits the learning process and often deceives the student as to the true nature of the subject. It is far better for the student to wrestle with Hamlet or The Odyssey in all their difficulty, profundity and beauty than to encounter them predigested and excerpted in an anthology. This principle applies across the curriculum. Better to study the daises in your own backyard than to read about the exotic orchids that only grow half a world away. Experiments have their place in an advanced science curriculum, but they cannot replace a basic experience of the natural world. A moment’s reflection reveals how ridiculous it is to dissect embalmed frogs in a lab when the student has never experienced a living frog in its environment. What does he really learn about frogs from such an activity? Experiments are designed to isolate the experimenter, his tools, and his subject from the world at-large. However, the results of the experiment only have meaning when they are interpreted in terms of the very world from which they have been isolated. Many different kinds of digital technology are being enthusiastically introduced into schools. Most of this is communications technology, or what is called “media.” It is important to remember that all human knowing is mediated, and therefore, in some sense uses “media.” Our senses mediate between their objects and our brains, and our bodies mediate between the world around us and our souls. Further, Our Lord Jesus Christ mediates between the Church and Our Father in heaven. So there is no question of rejecting mediation in general. However, it is important to critically examine the messenger, in other words, we must ask, “does this communications technology communicate?” In the case of the computer, which is the most prevalent form of communications technology being used in schools, there are serious problems. When we look at the computer, as it is functions in the “real world,” day-to-day life of the school, what jumps out is its power to distract. Thus, even before we question the capacity of the computer to mediate objects effectively, we see that its versatility as a platform for many kinds of tasks makes it an ideal tool for never getting to those objects, for never completing a given task. This power to distract strikes at the very heart of education which is concerned to build up a habitus, whether a science or moral virtue, through a continual engagement with a given object. A third characteristic that distinguishes poetic education from other liberal arts education is the centrality of the liturgy. (As Jean Leclercq notes in his book, The Love of Learning and the Desire for God, the liturgy itself is a kind of poem.) There are many ways to look at the liturgy and many things we can learn from it. Being a work of the Holy Spirit it is inexhaustible and of a transcendent integrity that resist all analysis. So what I have to say is in no way exhaustive, but all the same, I just want to point out two things. First, the liturgy is the end or purpose of the Christian life made present in time, or, looked at in another way, the liturgy brings us into the presence of the end of the Christian life; it is a participation, already on earth, in the life of the blessed. Now, as I’ve already mentioned, the end of the liberal arts is to free men from the seeming urgency and finality of worldly ends so that they may pursue beatitude. Thus the liturgy is intimately connected to the liberal arts. (Historically this is the case since the tradition of the liberal arts began with Plato’s Academy, and the Academy was an association established to worship the Muses.) It has an irreplaceably centrality in a liberal arts school since only the liturgy can open the school to the divine world, thus protecting it from the everyday world which continually threatens to enclose it. A second thing to note about the liturgy is that it is a school of praise. The book of the Apocalypse, which lifts the veil on the heavenly liturgy, gives us a glimpse of the praise of the angels and saints. They praise God as both creator and redeemer of the world. The philosopher Josef Pieper entitled one of his books, Only the Lover Sings, taking the phrase from St. Augustine. What does the lover sing? He sings praises. He praises God and his whole creation—women, wine, the deeds of great men, dappled things—everything under the sun and above the moon. It is here that we are closest to the heart of poetic education. All the great poets are lovers. It’s their love that gives them eyes to see and tongues to sing with. Poetic education aims to open its student’s eyes to the True, the Good and the Beautiful, not as dead subjects in a textbook, but as objects worthy of praise. 6. If someone is interested in getting more information about sending their son to Gregory the Great Academy or in donating to your fine school, what would be the best way for them to contact you? If you didn't get a chance to watch their video for their ongoing appeal to raise funds for students who can't pay the tuition, please give it a watch. It shows, with a sense of humor, what places like these are, which is enough to show why we must value them.